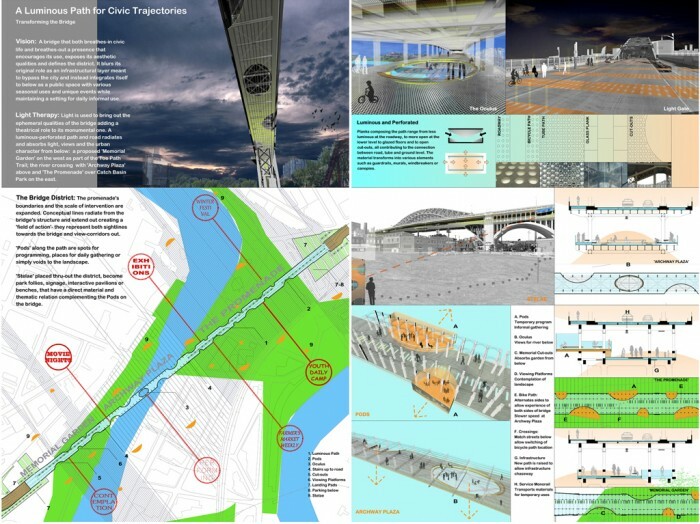 Vision: A bridge that both breathes-in civic life and breathes-out a presence that encourages its use, exposes its aesthetic qualities and defines the district. It blurs its original role as an infrastructural layer meant to bypass and instead integrates itself to below as a public space for seasonal uses and unique events while maintaining a daily informal setting. Light is used to bring out the ephemeral qualities of the bridge adding a theatrical role to its monumental one. 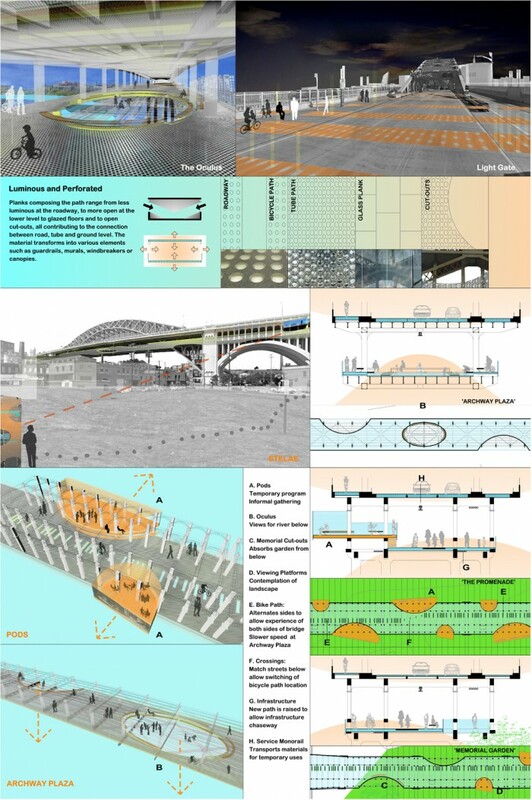 A luminous-perforated path and road radiates and absorbs light, views and the urban character from below: a proposed ‘Memorial Garden’ on the west; the river crossing with ‘Archway Plaza’ above and ‘The Promenade’ over Catch-Basin Park on the east. Planks composing the paths range from less luminous at the roadway, to more open at the lower level to glazed floors and open cut-outs, all contributing to connecting the different levels. Pods’ along the path serve for programming, daily gathering or simply voids to the landscape. The promenade’s boundaries and the scale of intervention are expanded. Conceptual lines radiate from the structure and extend out creating a ‘field of action’- they represent both sightlines towards the bridge and view-corridors out. 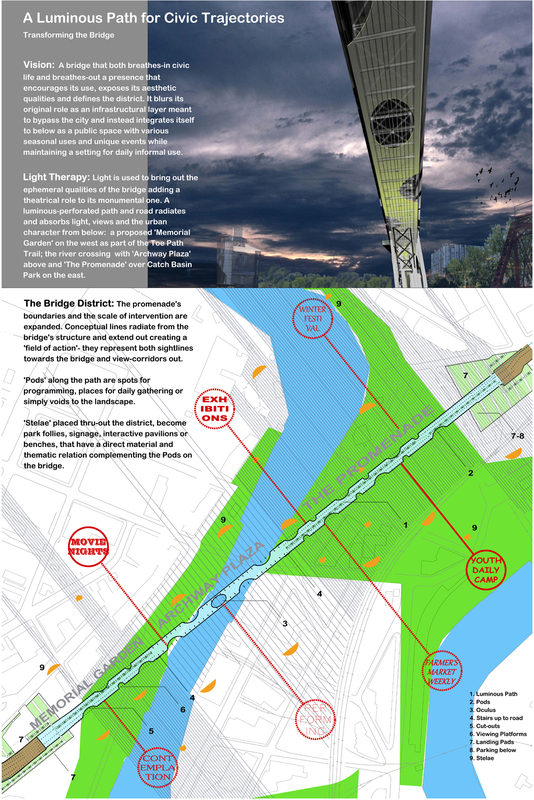 ‘Stelae’ placed thru-out the district, become park follies, signage or interactive pavilions, and in theme the Pods on the bridge.